Grown for the bright yellow flowers, and attractive deep green foliage Mahonia are a good plant for many landscaping situations. One of the main attraction is the foliage, wonderful texture year round which is a welcome addition to any garden. Most species will reach to around 2m in height and the spiny foliage is a standout. 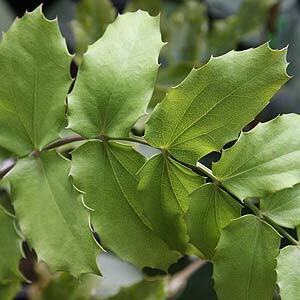 Underused in Australian gardens, these are a plant that offer texture through the foliage, and colour in winter with good bright yellow flowers. 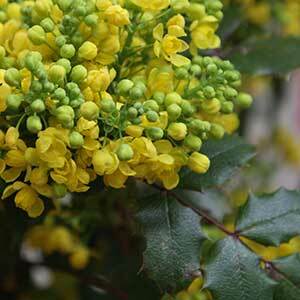 Mahonia prefer semi shade and moist soil but are a tough plant and will tolerate harsher conditions. All species can be pruned to control size. Mahonia flowers are followed by bluish black berries, sometimes used as a jelly. These are not a large plant and can easily find a place in most gardens, grow them for the foliage, or for the winter flowers, they are rewarding and easy care. Height – 1 to 2 metres for most varieties, some taller. M. nepaulensis – This is a rare species from Nepal, taller growing than most.